DOVER – As revitalization continues at the former NVF facility in Yorklyn, DNREC’s new water quality project at the site has been recognized as an Exceptional Project by the EPA, one of five such projects nationwide, for its excellence and innovation in Clean Water Infrastructure, winning the coveted PISCES award. Two DNREC Divisions, Waste & Hazardous Substances, and Parks & Recreation, collaborated to remediate the zinc-contaminated site at the former factory. Following the cleanup, a created, remediated two-acre wetland is nearly complete, in addition to four other wetlands that will soon be constructed in the vicinity. In addition, three new trails at the former NVF site have been completed: the Yorklyn Bridge Trail, the Oversee Trail, and the “CCArts Trail” (yet to be officially named). Under construction now is a bridge that will connect the Yorklyn Bridge trail to Benge Road and the Auburn Heights Mansion. 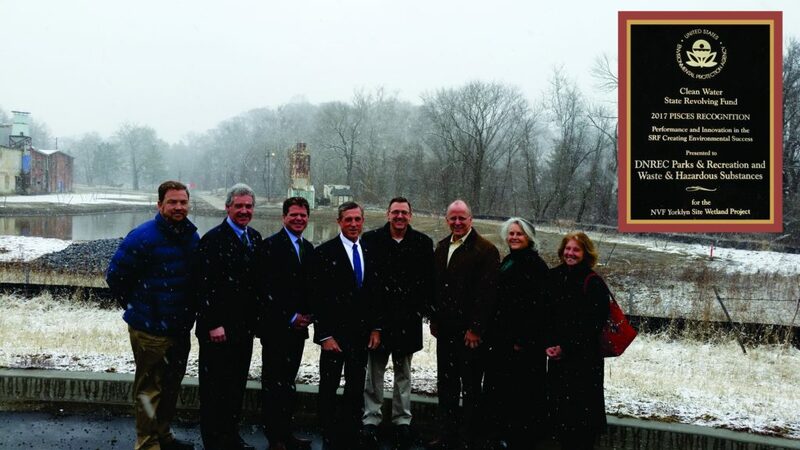 The PISCES award recognizes the importance of the new wetland to mitigate flooding and improve water quality in the Red Clay Creek area, the support of the economic redevelopment of the Yorklyn Fiber Mills District, and the innovative use of funding for the project. 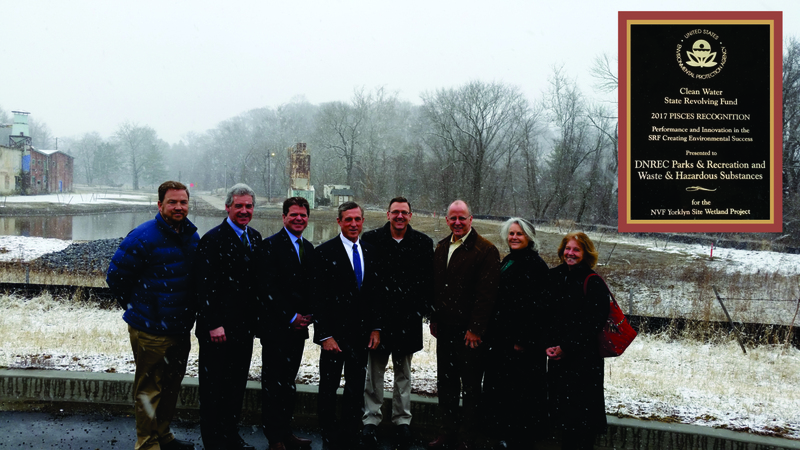 Pictured left to right: Matthew Chesser, DNREC administrator of preservation planning; DNREC Secretary Shawn M. Garvin; EPA Region 3 Administrator Cosmo Servidio; Governor John Carney; John Cargill, DNREC environmental scientist, Site Investigation and Restoration Section; State Senator Gregory F. Lavelle; Marjorie Crofts, director, DNREC Division of Waste & Hazardous Substances, and New Castle Councilwoman Janet Kilpatrick. The EPA award acknowledges excellence and innovation within the Clean Water State Revolving Fund (CWSRF). The CWSRF is a federal-state partnership that provides communities with a permanent, independent source of low-cost financing for a wide range of water quality infrastructure projects. The EPA’s PISCES (Performance and Innovation in the SRF Creating Environmental Success) award celebrates innovation demonstrated by Delaware’s CWSRF programs and assistance recipients. In total, $3.3 million in CWSRF loan financing was provided to DNREC’s Division of Waste & Hazardous Substances to remove zinc-contaminated soils and create the two-acre wetland by replacing industrial-contaminated soils with clean fill material and topsoil, Another $1 million CWSRF Water Quality Improvement Loan was provided to DNREC’s Division of Parks & Recreation to create the four additional wetlands. DNREC’s Environmental Finance Office used several innovative financing tools to facilitate project funding. Funding to provide repayment of the CWSRF loans was secured by the state’s Hazardous Substances Cleanup Act and the Division of Parks & Recreation. The soil remediation efforts at the NVF site included the removal and disposal of approximately 170 tons (340,000 pounds) of zinc and more than 200 pounds of hazardous lead from the soil during a seven-month period beginning in December 2016. A groundwater zinc recovery and treatment system has also been in operation at the site since 2008. Converting the excavation into a wetland that provides flood water storage capacity and other wetland benefits is necessary in the historically flood-prone Red Clay Creek Valley. For perspective, using average recovery rates of zinc from the existing treatment system, it would have taken nearly 40 years to remove the same mass of contaminants from groundwater, at an estimated cost of $14 million. Utilizing the $3.3 million CWSRF loan enabled DNREC to perform necessary remediation in the short term, thus saving taxpayers a projected amount of $10.7 million in the long term. Using funds for contaminated site remediation has not been done in Delaware before, and is just one of many unique and innovative solutions that the project team employed to complete the work. Substantial savings to Delaware taxpayers will result, and further redevelopment will occur at an accelerated pace. Future redevelopment at the site is designed to provide decades of increased economic value and will be a unique destination to visit and explore in historic Yorklyn. Media Contact: Beth Shockley, DNREC Public Affairs, 302-739-9902.